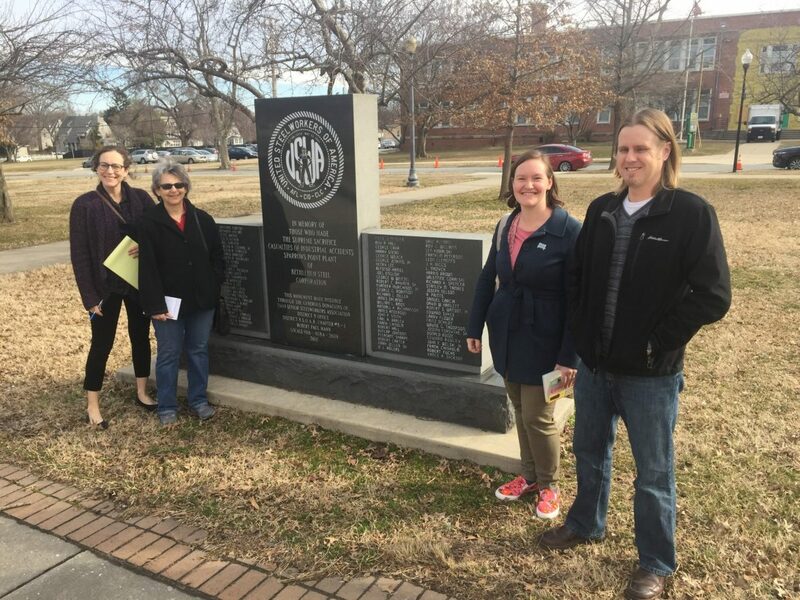 On a blustery morning in March, acclaimed local union expert Bill Barry led four BMI representatives on a tour of industrial sites on and around the Sparrows Point peninsula. Bill, who served as CCBC’s Director of Labor Studies from 1997-2012, has conducted extensive oral histories with Bethlehem Steel employees. He has compiled much of his research on the Sparrows Point Steelworkers website and in his forthcoming book, “All We Do is Talk Steel.” He has served an invaluable resource for the BMI on many programs. Four of us involved in the museum’s Bethlehem Steel Legacy Project met with Bill to gain a better understanding of the geography that shaped the steel industry in Maryland. Project Consultant Deb Weiner, who is heading up our outreach to the Sparrows Point community, Research Historian & Grant Writer Joseph Abel, Director of Interpretation Beth Maloney, and myself (Community Programs Manager) piled into Joseph’s car for a morning of exploration. Bill led us to about 20 points of interest in the span of three hours, acknowledging that we were just scratching the surface of this fascinating chapter in Baltimore’s story of industry. 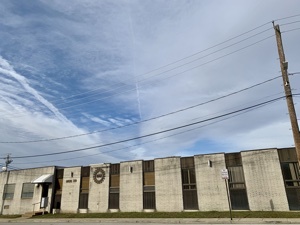 We began in the post-war city neighborhood of O’Donnell Heights and first stopped at the United Auto Workers union hall just north of O’Donnell Street. We then drove by two other icons of past industries: the former General Motors plant on Broening Highway, which closed in 2004 and is now an Amazon facility, and the expansive Western Electric building featured in the museum’s recently updated telecommunications exhibit. Bill pointed out that countless restaurants and bars once lined the neighborhood to serve the thousands working round-the-clock shifts. We observed vast, colorful stacks of containers lining the road adjacent to the Seagirt Marine Terminal—evoking flashbacks to season two of The Wire. 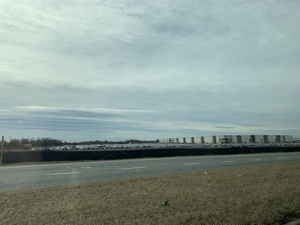 We drove past several complexes still in industrial use and a great deal of newly constructed office parks as we entered Baltimore County along Holabird Avenue. The close-knit community of Turner Station, an African American enclave established across Bear Creek from Sparrows Point during the era of segregation, was our next stop. We wound down narrow one-way streets to find the home of Henrietta Lacks, just down the road from the Fleming Senior Center. We observed some of the revitalization efforts led by the Turner Station Conservation Teams and described in a recent Baltimore Sun article with tidy new doors on many multi-family housing units. Heading down Peninsula Expressway, we could see the massive scale of the 21st century industry currently occupying Sparrows Point. The site now owned by Tradepoint Atlantic (which, it should be noted, is a major funder of the museum’s multi-year initiative) is home to warehouses for major corporations like Under Armour, FedEx, and Amazon. It is hard to imagine the enormity of the steel operation that once covered Sparrows Point without having seen it in person. This interactive tour helps me visualize the once-dense built environment, but I find this flat landscape to be somewhat disorienting. 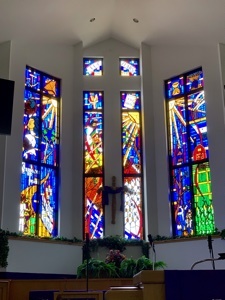 Next on the tour was the community of Edgemere, where we stopped in at Shiloh Baptist Church to see the stunning stained glass windows that tell the story of Bethlehem Steel in this community. We then made our way further east to pass Todd’s Inheritance and North Point State Park before coming to the entrance of Fort Howard. We turned around in front of this park and former military complex with plans to check it out another day. I find it fascinating that this part of the peninsula played a strategic role not just in industry but also during the War of 1812. I look forward to exploring how these many layers of history intersect in the 21st century. 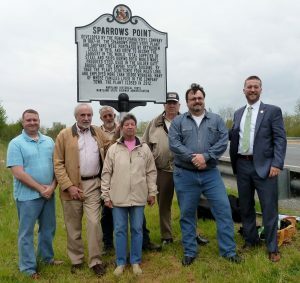 Bill recently worked to share the history of Sparrows Point on a roadside marker located at the busy intersection of North Point Boulevard and Bethlehem Boulevard, just off the beltway. We drove past this sign en route back to the city via Sollers Point Road, also passing the site of the former Seagram’s Distillery demolished in 2017. 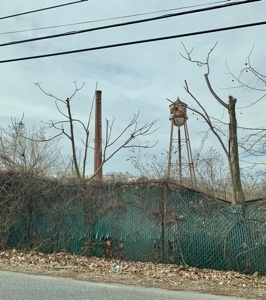 The smokestack emblazoned with the words “Baltimore Pure Rye”—a designated county landmark—stuck out to me as a beacon of the region’s rich history (and booming future) in distilling. The two now-vacant United Steelworkers of America union halls on Dundalk Avenue made up our final stop on this whirlwind tour of industrial east Baltimore. For an outsider like me, who grew up across the country without any personal ties to Bethlehem Steel, Bill’s tour of Sparrows Point provided a crash-course in the steel industry in Maryland. After just a morning of exploration, it’s clear to me that the story of steel is inextricably intertwined with this landscape. I’m looking forward to learning more about these connections and understanding their relevance today. I am grateful to Bill for taking the time to share his wealth of knowledge with us. Auni Gelles is the museum’s Community Programs Manager, overseeing the BMI’s community outreach efforts, public programs (such as workshops, presentations, film screenings, author talks), and Farmers’ Market. A Seattle native, she currently lives in Hampden with her husband, son, and dog.